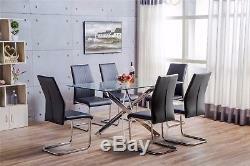 LEONARDO Black White Chrome Glass Dining Table Set And 6 Leather Dining Chairs. Glass always gives a bright and spacious feel to your dining space, creating a light open look. The Leonardo Large Glass and Chrome Dining Table is perfect for adding a brighter look and feel to your interior, as the chrome legs gently reflect the light while the modern glass table top gives the illusion of more space. The Leonardo can be paired with with some equally stylish dining chairs (of which we have two options) creating a stunning contemporary look! What You Need To Know. The table top of the Leonardo is made from 12mm thick tempered glass. Tempered glass is incredibly strong and very durable. Making it an ideal material choice for something used as often as a dining table. A glass table top will gently reflect the light throughout your dining space, while its transparency creates a feeling of spaciousness. This is a great feature to have on a larger dining table as it still keeps the space looking open and light, despite the table itself taking up a larger amount of space. This modern glass dining table is 150cm x 90cm, curved on the two longer sides. You can easily seat 4 to 6 dinner guests, with 2 chairs on either end of the table. This makes the Leonardo ideal for both everyday dining and for when you have a few extra guests to seat. The 4 legs of the Leonardo are finished in a shiny modern chrome. This complements the sleek modern finish of the glass top while also giving you a stylish finish to coordinate with other finishes in your interior. We have two options for the chairs. Both chairs are incredibly comfortable and complement the chrome look of the table, with their own chrome finish. Sophisticated look meaning they will fit seamlessly into an modern setting. The Leonardo Large Glass and Chrome Dining Table and Chair set is sleek, stylish and definitely the dining table you need if you want to add an ultra modern look in your home. Don't just take our word for it! See what our customers have said.. All of our products are compliant with UKFR regulations and undergo ANSI/ASQ Z1.4 standard inspections to ensure the quality and finish of our products are to the highest levels. There can however be exceptions where parcels are delayed. Deliveries to surcharge postcodes may take a bit longer. Although unfortunately we will not be able to give you a specific time. Deliveries to surcharge regions may take slightly longer. Furniturebox is a Wiltshire based company, specialising in great value modern Furniture. Our aim is to provide our customers with contemporary pieces at a fraction of what you would pay on the high street. We work closely with our suppliers to provide us with the best possible prices, whilst not compromising quality or performance. Through minimal marketing and low overheads, we are able to deliver the best deals, representing real value. At Furniturebox we take pride in our rapid dispatch time, with over 95% of our items arriving within 24 hours of ordering. Unlike other online retailers, all our stock is ready to go, so no waiting around for weeks! Our young and adaptable research team are always at the forefront of new designs and trends enabling us to keep ahead of the times. We sell household must haves from dining sets to sofas and our product portfolio is ever increasing. Our helpful customer service team are dedicated to providing a good all round shopping experience and we are always more than happy to help with any customer questions. Although, we will not be able to give you a specific time. If for whatever reason the item arrives damaged we will arrange collection of this and a replacement will be sent out. Any damage on an item must be bought to our attention within 3 days of receipt. The item "LEONARDO Black White Chrome Glass Dining Table Set And 6 Leather Dining Chairs" is in sale since Friday, September 01, 2017. This item is in the category "Home, Furniture & DIY\Furniture\Table & Chair Sets". The seller is "furnitureboxonline" and is located in Mere. This item can be shipped to United Kingdom.